From Delhi our tour took us on an overnight train to Jodhpur in the state of Rajasthan. The Indian railway system is the largest (in terms of daily passenger load and employment) in the world. The 12 hour trip left Delhi at 9pm. We had third class sleeper tickets, which apparently were the best you could buy, but I would not call it luxury by any means. However, it was reasonably comfortable and adequate. If you have never gone on an overnight train in India I do recommend getting the experience! People constantly come through the train offering note chai, snacks and food (everything is very cheap). You also get to see some countryside along the way in the evening and morning. That said, you will be sharing your sleeper car with about 60 others, split into berths of 8. 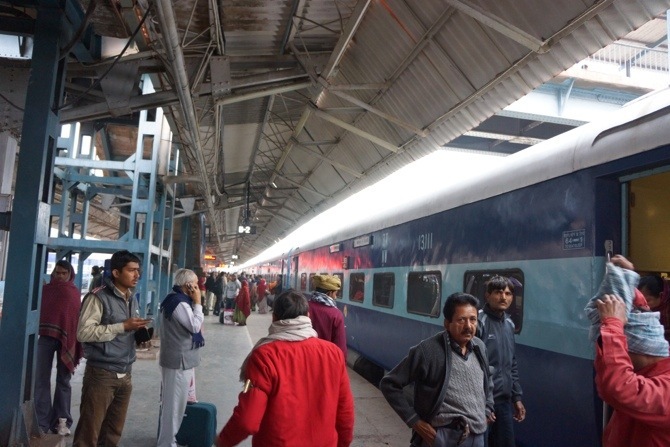 Smells, noises and general encroachments on personal space are bound to happen, however in the five or six overnight trains I’ve taken in my life in India I’ve never felt unsafe. Just be aware of your surroundings and use common sense. I’ve always found my fellow train passengers to be more helpful than anything else, even if they snore, fart and belch all night long (Seriously! This happens every time). It is crucial to bring an eyemask and high quality earplugs along if you want to have any hope of sleeping. I did, and slept like a baby all night. I also recommend bringing a travel sleep sack (a sheet sewn up on one edge) and a travel pillow along (along with water and your own snacks). While they give out clean sheets, blanket and pillow on the train….I also prefer to use my own if I can for added warmth, comfort (have your ever slept in a silk sleep sack? What luxury!) and cleanliness. We arrived in Jodhpur in the morning, made our way to our hotel for a quick wash and then ventured our for a walk around the town and a tour of a majestic fort perched on a mountain about the city. More on that stuff in the next post.